The liver is responsible for many vital functions in the normal anatomical functioning of the human body including blood detoxification, protein synthesis and producing chemicals necessary for digestion. Peroxisomes are vital to the healthy function of the liver. These teeny tiny vesicles are found surrounding liver cells and contain enzymes responsible for many metabolic reactions including energy metabolization and holding the digestive enzymes necessary for breaking down toxic matter in the cell. Peroxisomes are enclosed in a single membrane and are 0.5 micrometer in diameter. In some mammalian tissues, peroxisomes form an extensive network. 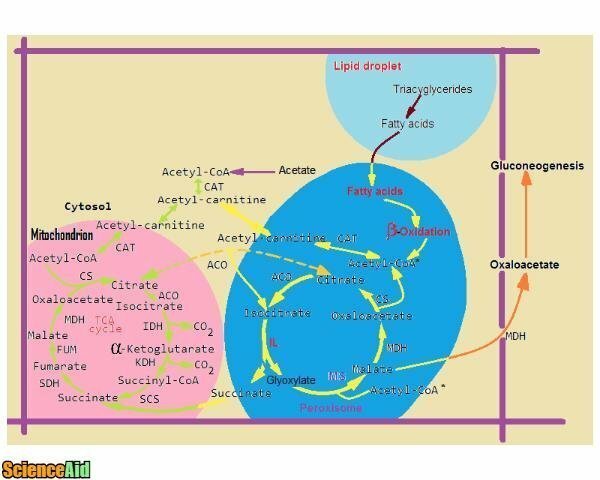 Often compared to lysosomes, peroxisomes differ in that they hold antioxidative enzymes. Peroxisomes contain more than 50 enzymes and self-replicate by enlarging and then dividing. They contain H2O2 producing enzymes like oxidases and catalases as well as oxidative enzymes like peroxidase, Catalase, glycolic acid oxidase and some other enzymes. Proteins are selectively imported into peroxidases. Peroxisomes contain no DNA or ribosomes and have no means of producing proteins. Instead, all of these proteins are imported across the membranes. Peroxisomes are involved in the formation and decomposition of hydrogen peroxide and the word peroxisome is actually derived from hydrogen peroxide. Peroxisome contains oxidative enzymes, such as catalase, D-amino acid oxidase and uric acid oxidase. They use molecular oxygen to remove hydrogen atoms from a specific organic substrate (R) in an oxidative reaction. It produces hydrogen peroxide (H2O2 is a toxic byproduct of cellular metabolism). Peroxisomes are important for lipids metabolism. In humans, oxidation of fatty acids greater than 18 carbons in length occurs in peroxisomes. In yeast, all fatty acid oxidation occurs in peroxisomes. A major function of peroxisomes is the breakdown of fatty acid molecules in a process called beta-oxidation. In this process, the fatty acids are broken down into Acetyl-CoA. It is then transported to back to the cytosol for further use. Peroxisomes contain the first two enzymes required for the synthesis of plasmalogens (myelin sheath). Peroxisomes also play important roles in cholesterol and bile acid synthesis, purine and polyamine catabolism, and prostaglandin metabolism. In plants, peroxisomes are required for photorespiration. A deficiency in the protein in peroxisomes causes abnormalities in the brain called Zellweger syndrome, a rare congenital disorder in the leukodystrophies family which presents with head and face abnormalities. A deficiency in the Peroxin Pex 2 is responsible for a different form of Zellweger syndrome. MLA (Modern Language Association) "The Structure and Function of Peroxisomes." ScienceAid, scienceaid.net/the_Structure_and_Function_of_Peroxisomes Accessed 23 Apr 2019. Chicago / Turabian ScienceAid.net. "The Structure and Function of Peroxisomes." Accessed Apr 23, 2019. https://scienceaid.net/the_Structure_and_Function_of_Peroxisomes. Thanks to all authors for creating a page that has been read 17,450 times.